From Angelluz Religious Jewelry to Zumu Software and every letter in between, exhibitors at the 104th annual National Catholic Educational Association convention and exposition will display a plethora of Catholic-related products and services April 10-13. For a cleaner school, an attendee might visit the Oreck Vacuum booth; for a sweeter school The Candy Lady; for a more uniformed school, there’s Dennis Uniform; or the World Book exhibit for a better reference collection. These and the 696 other vendors represent the Catholic education market valued at $12.4 billion, according to NCEA statistics. The highest percentage of merchant categories on display will be books, instructional materials and school supplies; the lowest is school and library furnishings. 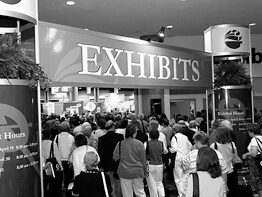 The 10,000 attendees will roam the Baltimore Convention Center floor also to collect information in their NCEA-logo totes on computer hardware, religious clothing, catechetical materials, religious goods, and fundraising and testing services. Exhibit space sells out quickly and is in great demand, reports NCEA, at the price of $960 for a 10-by-10-foot booth or $1,190 for the same-sized corner booth. Exhibitors are responsible for contributing to the overall objectives of the convention. NCEA is an important annual event for Catholic educators; exhibitors can add to the value of the four days by offering members the chance to discover new products and services for their schools and parishes. Their booth’s table will be piled half with religious merchandise for sale and half with literature promoting the shrine, a nationwide center of St. Jude devotions. A large picture of St. Jude will sit on an easel nearby. As Baltimore is included in the 20 largest dioceses for school student enrollment and because of the competition, merchants promote their goods every way they can. One method to boost traffic is to advertise in the convention program booklet.